Joining Ginny’s Yarn along again but with a dress. 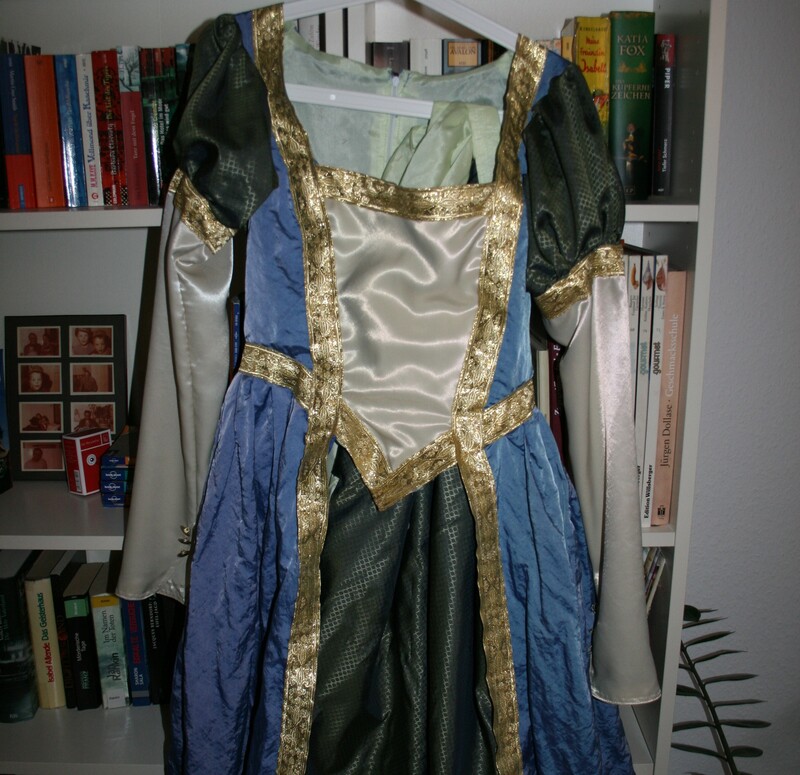 The reason why this week is less about knitting and more about sewing is easy: tomorrow starts the party part of Carnival in Düsseldorf and I gave myself a 30th birthday present: being a princess for Carnival for the very first time in my life. My mum never made me a princess costume. I was a gipsy, a witch, even a ladybug and a toadstool and though I don’t know if I really expressed that as a child but I really wanted to be a princess one day. And now I thought is the perfect time to do that: it’s Carnival and my birthday in the same week so I’ll be a princess. 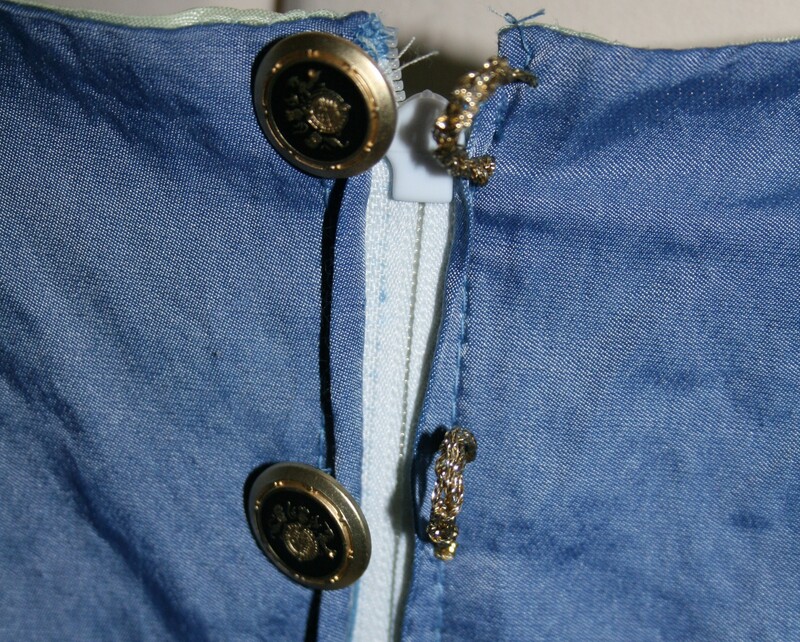 And as I make my costumes myself, this year I started a big project way back in autumn last year when I bought the blue taffeta and the buttons. I used a Simplicity pattern and then altered it to have puffed sleeves. Working with the golden galloon helped me to make it look well made even from the inside out (and this is something I usually love about costumes: they only need to look good from the outside and it doesn’t matter at all what they look like from the inside). And than I added some golden buttons with something like a coat of arms on it on the back and on the sleeves, making the loop from golden thread. But because the weather forecast already said that it would look that way (this is a picture from this morning), Carnival is quite a outdoor activity here in Düsseldorf and, because I didn’t read the pattern properly and made a mistake, the dress is very fitting and doesn’t allow for much to wear underneath, I had to make something to wear on top. I didn’t want to wear a normal coat on top. Looking all dressed up in the streets is as important as going inside and taking your coat of later. This is why I needed a cape. 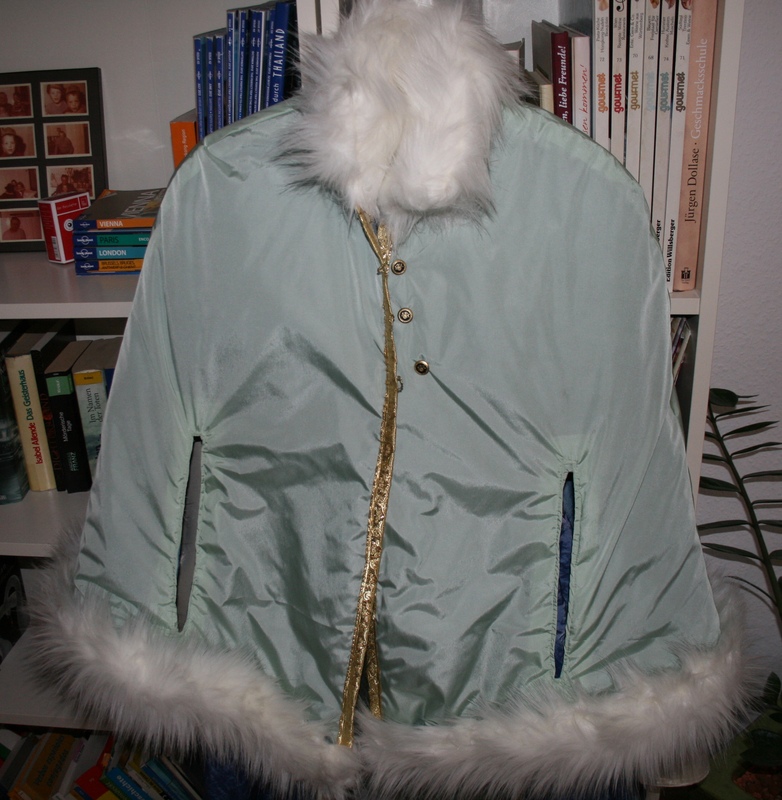 I got some cheap mint green cloths and some blue quilted lining that I actually doubled to achieve more warmth. I used the gold galloon again and the buttons. 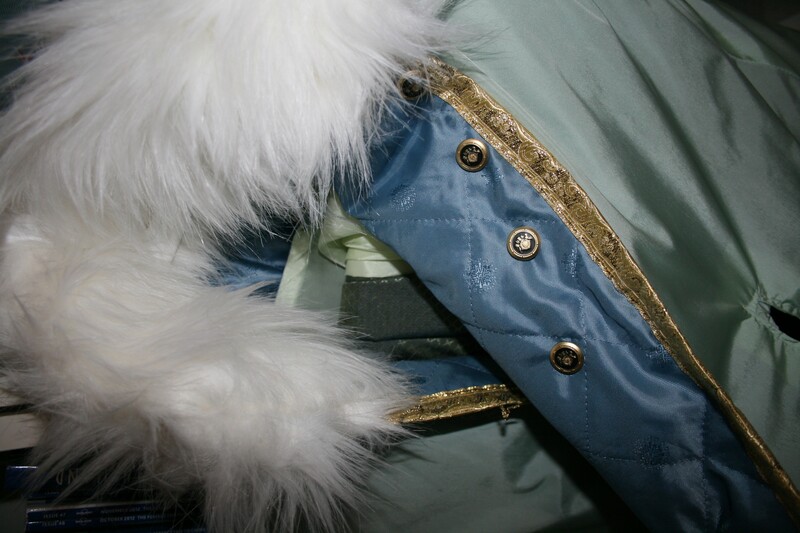 And to give it a final royal winter touch I added white fake fur at the edges. Further more the cape is even reversible with buttons on the out and the inside. 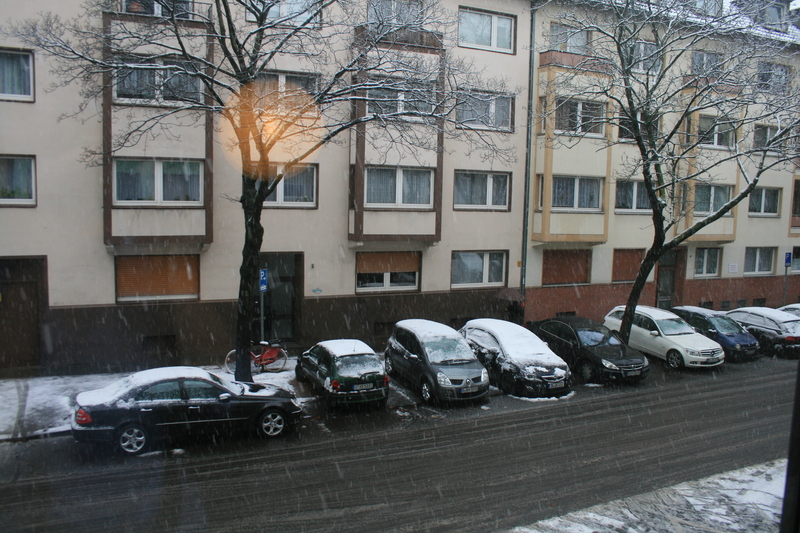 But now that I look outside I’m really wondering if instead of that golden tiara I wanted to wear I don’t better do with fake fur hat and maybe some gloves would be great too. Need to figure that out tonight because I will take my costume with me to work and go to party from there tomorrow. This entry was posted in Knitting & Crocheting and tagged Carnival, Dusseldorf, sewing, Yarn Along by kathatravelling. Bookmark the permalink.